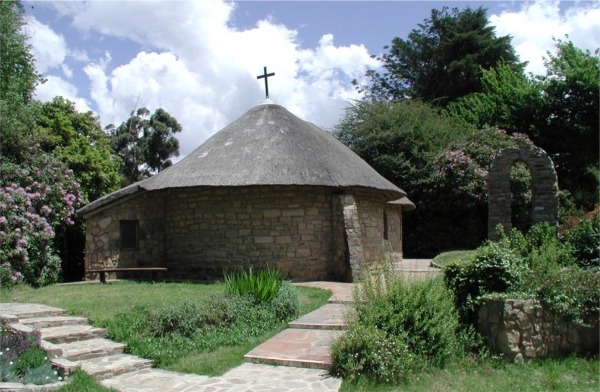 As the dusty Hogsback main road meanders slowly up the hill, the vegetation thicker and lusher with every turn, the quaint little chapel emerges on your left. Consisting of two combined rondavels, the curvy shape suggests something organic like a large butternut. The neat thatched roof, above which rises a single cross, speaks of a much loved and cared-for place. The garden is full of brightly coloured rhododendrons and azaleas. On the lawn a stone arch with brass bell stands as a memorial for the Revd Dr Bride Dixon, first woman priest in South Africa, and doctor on the mountain for many years. The chapel is also a regular place of worship. Although officially part of the Anglican Diocese of Grahamstown, it is an example of the ever-changing Christian community that it represents. Services are shared by the Presbyterians, Methodists, N.G. Kerk and Anglicans. The chapel was first built in 1935 by Kenneth Hobart Houghton as a private place to worship. 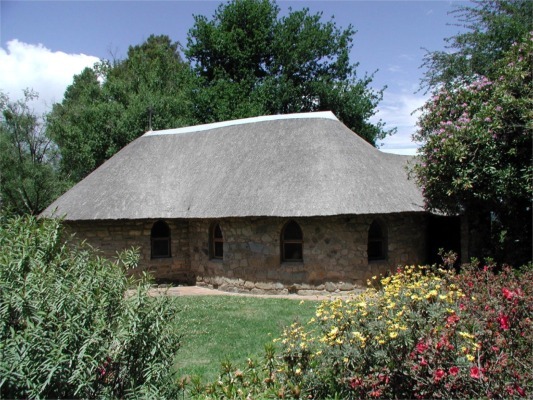 It was first designed as a single rondavel and after its donation to the Anglican Church, the local congregation grew, and it became necessary to extend it. The second rondavel which gives it its characteristic butternut shape was added in 1992. In June 2010, fire destroyed almost the entire building and the rebuilt Chapel was dedicated by the Bishop of Grahamstown on the Feast of St Patrick (17 March) 2011, with the Archbishop of Cape Town celebrating the event three days later. There are many noteworthy features in the Chapel, and in the foyer you will find a description of these. These precious items are a tribute to many donors all around the world who treasure this little place of worship. East of the Chapel are the two walls of remembrance. 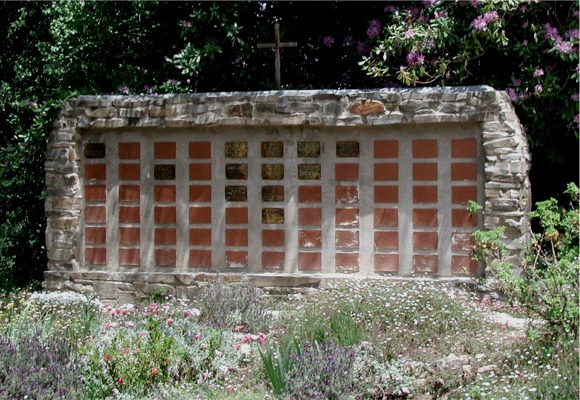 Here small plaques mark the last resting place of many well remembered Hogsback characters. The second wall was built for the 75th Jubilee of the Chapel in 2010. St Patrick's is kept open to visitors 24 hours a day and you will be welcome to come and spend a little time in prayer or meditation. Sunday services are at 10:00, and notices of festivals and special services will be found on the door.